I have heard of Saint Gorge and the dragon, King Arthur's Knight of the Round Table, The Black Knight and Green Knight but not really any other tales of adventures concerning mythological Knights of Legends. Does any one one know of any other tales of Knights that are not real accounts of history or modern creations. The kinds that would have been told as stories around a fire on cold winter nights, kind of like Beowulf (I know he was a Viking and not a knight). You'll probably want to look at period literature for stories such as these. The French Romances, Mallory's Morte D'Arthur, Chaucer, and Spencer's Fairy Queen are all good places to start, and if you are interested in the Viking side be sure to check out the Icelandic Sagas. Its often a fuzzy line between myth, folklore and history but I second the nomination of the Sagas of the Icelanders. The penguin edition at 21 bucks is an over the top bargain. 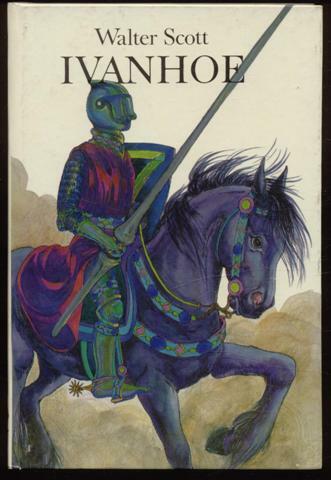 If your looking for one great story about a knight read Ivanhoe by Sir Walter Scott. It is one of the best books I've ever read. Its got the tournaments, the battles, the fair ladies, etc., but the best part is the writing. Make sure you get some kind of addition with the notes. If your looking for one great story about a knight read Ivanhoe by Sir Walter Scott. It is one of the best books I've ever read. Its got the tournaments, the battles, the fair ladies, etc., but the best part is the writing. Yeesh. Ivanhoe? The prose style is nice, but I can't quite get over its many anachronisms and the big spanking deus ex machina Scott used to get the desired resolution to the story. Sure, it might be worth reading when accompanied by good critical notes, but I wouldn't recommend it as a tale of medieval knights. It's best read as a source for understanding 19th-century ideas about (what they thought was) the Middle Ages. For classic "high fantasy" accounts, I'd also recommend the works of Lord Dunsany and William Morris. Great stuff. If you wish a bit of historical background--a knight's manifesto, if you will--you might enjoy Ramon Lull's Book of Knighthood and Chivalry, available from Chivalry Bookshelf. Other obvious choices would be The Song of Roland, Orlando Furioso, etc. My favorite has to be the full frontal assault of Song of Roland. As others have noted other ones. Geoffrey of Monmouth has terrific chronicles prior to Mallory which include Arthurian elements as well. The Song of Roland is part of the legends of the Peers of Charlemagne--note that Roland, Orlando, Hroudland, or whatever you choose to call him was one of the Peers and the Great King Charles himself practically always appears in the Roland legends along with a varying number of his household knights (i.e. the Peers). The Decamerone stories are also great fun. Mostly not very moralistic, but good fun nonetheless. An epic poem. It tells the story of dragon-slayer Siegfried at the court of the Burgundians, his murder, and of his wife Kriemhild's revenge. Try the Chanson de Geste, it covers a wide range of knightly heroes; that is, if you are interested in heroes during their own time or a little after. The Chanson de Roland is also very good. There are many tales of Charles the Great, and I think he is often considered the father of chivalry. That said, there is also the Cid. El Cantar de Mio Cid: Cid basically saves infants, women, and honor. He is sort of like the Commando of the medieval ballad. You could also try the Knight's Tale, which is found in Chaucer's Canterbury Tales. I'm sure that many other knights had quite a following and inspired lyrical ballads. I'm sure that not all were recorded. The written word seemed to dwell on clerical matters for much of the period we are discussing. I saw Scott and Tolkien mentioned earlier. I'll just say this, I think that Tolkien was far more interested in Teutonic than Celtic literature, and not only because he says so in his letters. His work seems more about tribal heroes than actual knights living in the age of chivalry. I mean, they have feudal titles, yes, but other than a warrior's code, Tolkien's characters do not adhere to any strict code of proper chivalry. Scott is kind of misunderstood. Ivanhoe is not quite what it seems, and the Saxons and Normans in the book, might be looked at as more of Scots and Englishmen during Sir Walter's own day; the book was somewhat political; at least, that's what I was taught at University. I just happen to think the intentions of these two authors and their subjects, might not be what you are looking for. I could be wrong. I forgot, although he is not a knight, strictly sspeaking, you might want to look at the Geste of Robin Hood. It might be called, A litte Geste of Robin Hood. It's not strictly medieval, but it seems to take place in the medieval era; therefore, it might have a much longer lineage. Robin Hood sort of seems like a serial killer in it, but it's interesting. Beavis of Hampton (insane, just insane), Fulk Fitzwaren, Guy of Warwick, Barbour's Bruce , Tom of Lincoln, and you could also check out the Frauendienst.